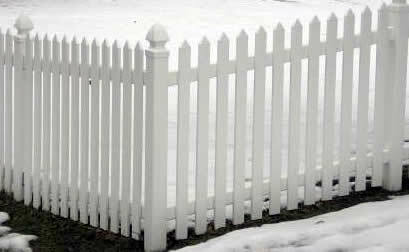 Homestead Fence Company, offering no maintenance vinyl fencing that's dependable and durable. With vinyl fencing, the options and styles are almost endless. The biggest gain with vinyl is the fact that there is no maintenance of the product once it is installed. The companies that we use for vinyl suppliers are not that of box store qualities, where the vinyl is a thinner material and will break down faster, as well as be very brittle in the cold. Vinyl fences are generally more costly to other fencing types, especially when compared to cedar, which is available for a fraction of the price. The thing to remember is that there is no painting or having to replace posts or boards that might break. E-mail us or call us to see a full color brochure of all of your options for vinyl fencing.